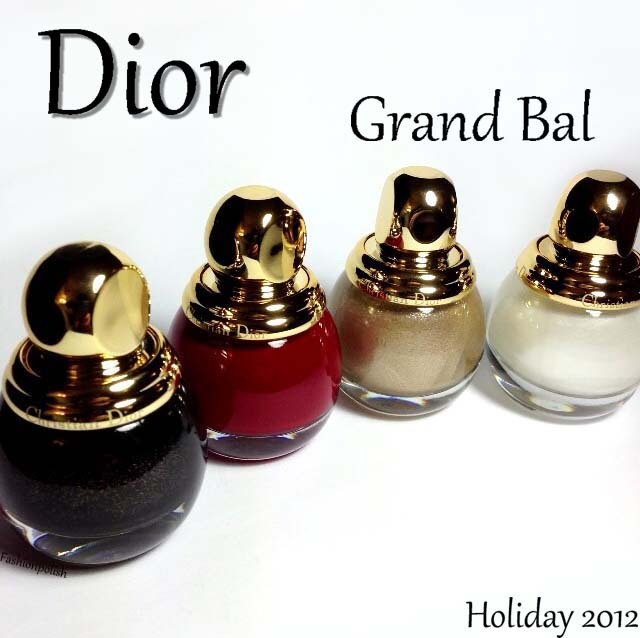 It's no secret that Dior has recently completely re-vamped their Grand Bal Holiday collection with a Limited Edition Diorific line that will most certainly appeal to you with their round and voluptuous bottle shape. Lady is a very luminous white frost. While I'm not at all into frosts, I believe that there's still a market for them so I try not to be too arbitrary. I used 3 very thin coats here, the first two looked like I wouldn't be rid of brushstrokes but the third particularly improved the overall look. Application tips : use thin coats and work fast without going over the same spot twice. You're looking at 3 thin coat of Lady, one coat of regular topcoat and one coat of matte topcoat to minimize the brushstrokes. 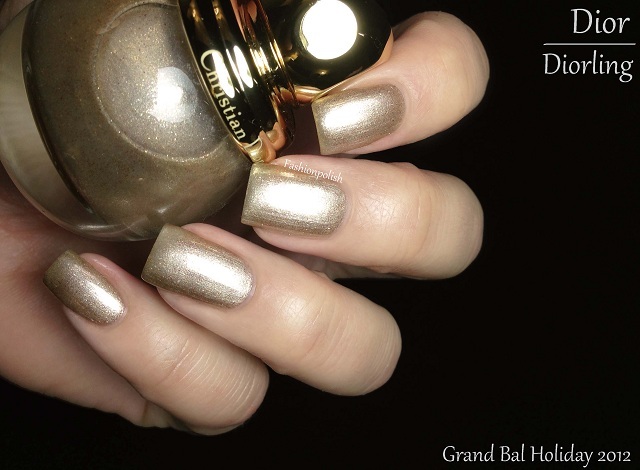 Diorling is a very sheer gold shimmer with an array of gold and brown particles. It looks very pretty in the bottle but I'm not sure it suits my skin tone. It would be perfect for someone fairer though... I used 4 very thin coats to achieve an almost complete coverage but I think next time I'll be using it over a dark color to add a complex shimmer. Marilyn is hands down my favorite in this collection and a complete stunner! I don't usually go for reds and oddly enough I have a gazillion of them but if I had to only keep one for the rest of my life, this would be it. Perfect, deep and extremely glossy blue based red jelly, it completely blew me away when I put it on. I used the 2 easiest coats and topcoat for these swatches. 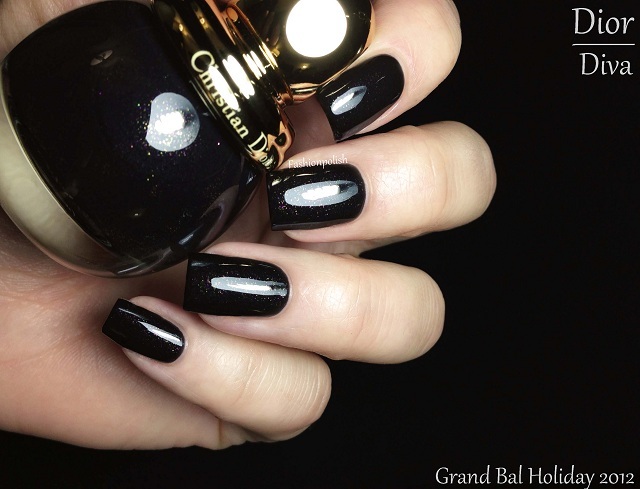 Diva is a slightly brown black scattered with pink and gold shimmer. 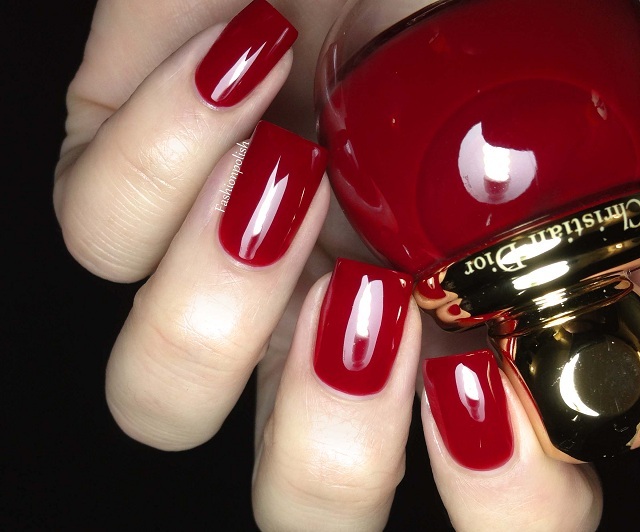 It's super vampy and if Marilyn hadn't been such a good surprise, I would definitely have called it my favorite. 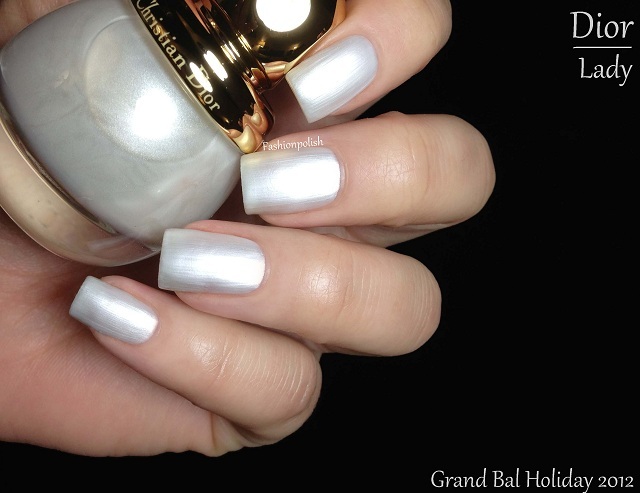 The shimmer is very subtle but combined with the brown hue it prevents it from falling flat. Formula was fantastic and the polish opaque and self levelling. You're looking at 3 coats plus topcoat. I knew I would love the polishes but didn't think much of the limited edition bottle shape. Truth is they just feel like little treasures filled with the most precious liquid, perfect for the Holiday season. 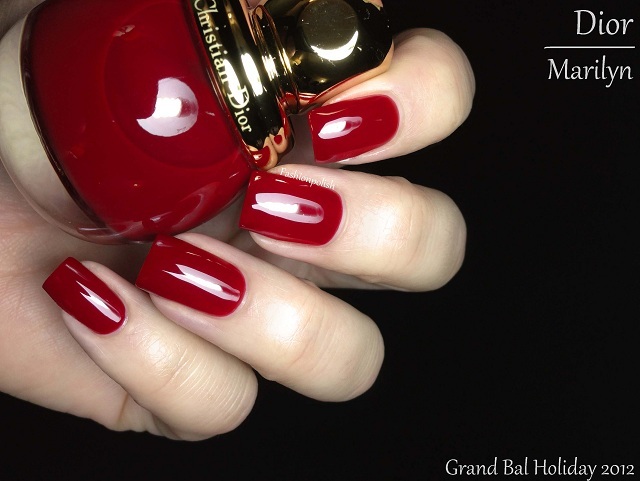 The Grand Bal collection is already available in boutiques and beauty counters around the world. 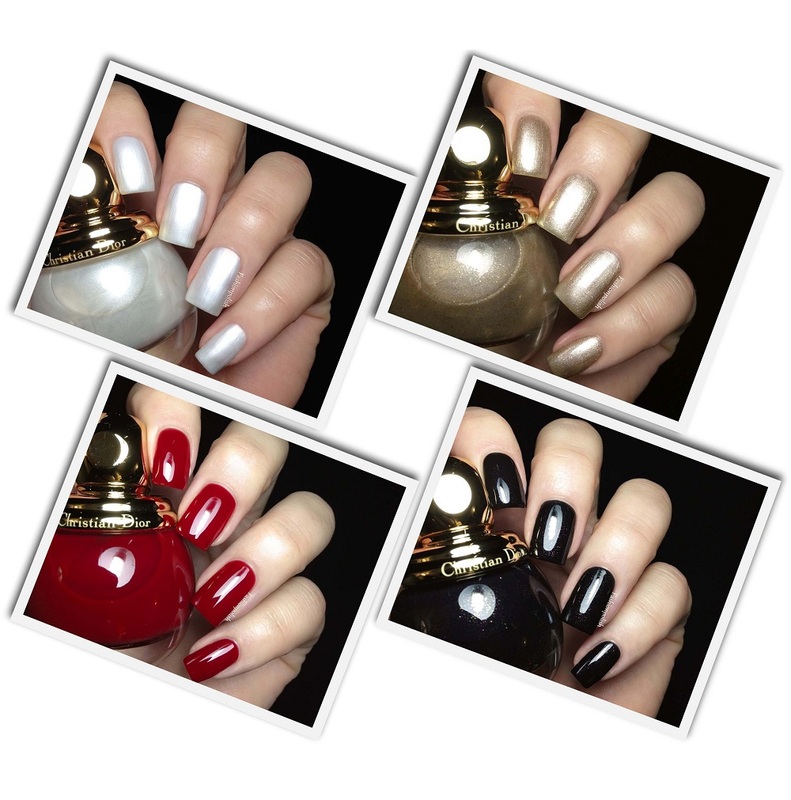 The polishes retail for $26 / £20 / 23.60€ for 12ml / 0.40 fl.oz (vs 10ml / 0.33 fl.oz) in the regular bottles). How do you feel about these girls? Do you like the bottles? Did you get any of them? Wow! These swatches made me weak at the knees! So beautiful. How are the brushes compared to the regular Dior polishes? Did the cap make them easy to use? Holy cow, those bottles are exquisite! How did you like the handle/top? This is a gorgeous collection overall. I never would have thought of using a matte top coat on a frost finish.. I'm trying that the next time I find one I want to wear. Thanks for the tip! What can I say? Immaculate swatches <3!!! I got myself Diva and Marilyn. Based on your review I very much look forward to using Marilyn. I felt a bit let down by Diva but that's not because the polish was not beautiful, I just hoped the shimmer would be more visible but alas I found a new home for it. These are so beautiful. I saw them on the Nordstrom website. It's the bottle too. I might treat myself to one. Diva is to die for! Amazing swatches! Beautiful swatches! I love both Lady and Diva! Those are some really unique bottles. I bought Diva, and I'd like to get Marilyn after reading this. 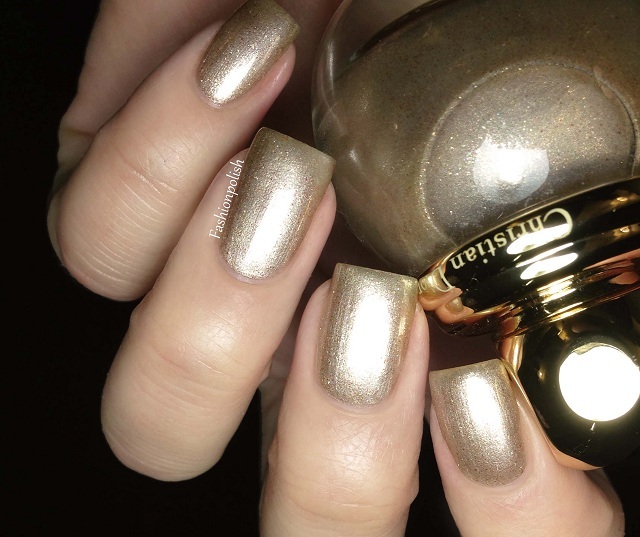 I'm also tempted to get Diorling just because I really like champagne golds. Not really that fond of any of the colors, but those bottles are SO cute!! god these are just the cuuutest bottles! i actually like the white frost the best! Diorling and Diva are definitely my favorite. Might have to pick these up! Gosh, I love the bottles. They are so adorable! Surprisingly, I like Lady on your pictures most. ANd I *hate* frosts and brush strokes! But it looks amazing and it glows! 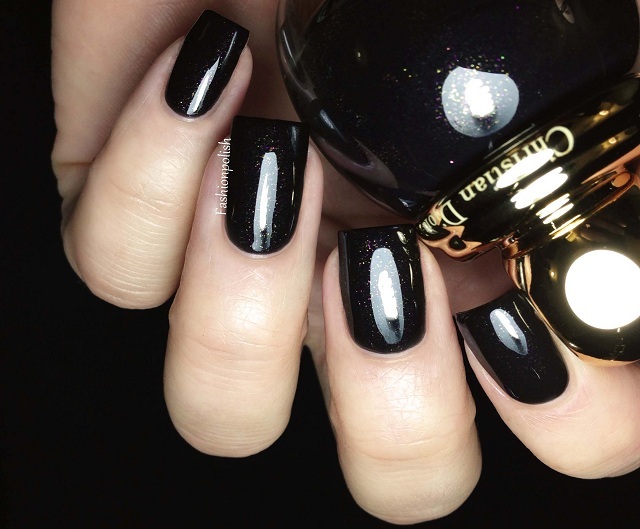 I would probably never wear it, because I simply can't apply frosts as perfect as you do, but on your nails it looks amazing. Love love love Diva - I look (stare!) at it every time I go to the boutique. Lady looks beautiful I got lady, marlyn and diva, love how you applied the lady! Not a dog in the group - and love the bottles despite they probably would take up a lot of extra space in my storage. they are a dream come true !!! Very nice. I got Diva and waiting for Marilyn. What kind of top coat you using?